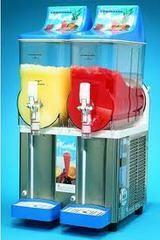 Double barrel slush holds 5 gallons of slush (2 1/2 each side). Gold Medal syrup recommended. Mix 1/2 gallon concentrate with 2 gallons of water. Due to the power requirements to run this machine, it must be plugged in directly into an outlet (no extension cords). Dedicate circuit strongly recommended. The fan for the slush must not be against a wall.